In which we tackle the elusive “like grandma used to make”, not just following a recipe but following a feeling, a taste from childhood. Boerenkool is a very stick-to-the-ribs sort of meal (but it’s also healthy- there’s kale in it), and for me, a comfort food like no other. Once in awhile, there will be an experiment going on in our kitchen. It is always the brainchild of my wonderful husband. Lately, he’s been learning about fermentation. 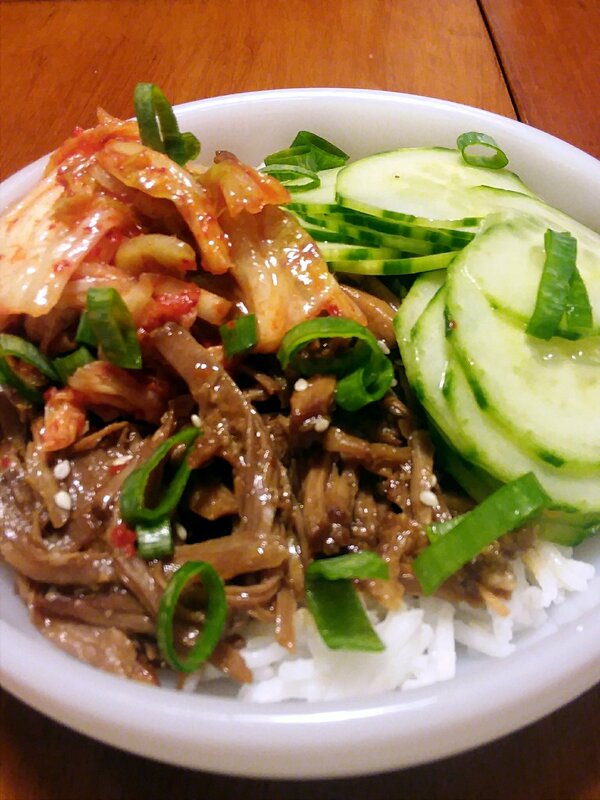 He’s made sauerkraut, kimchi, and kkakdugi just to name a few. They always smell awful, but taste delicious. Just being honest, honey. This time, we had a starter culture (basically the juice that contained the lacto bacillus, crucial for any ferment) left over from an empty jar of sauerkraut and we decided to try it out on another green, cabbage-family vegetable: kale. We chopped up 2 bunches of kale (one regular kale, one black kale), put them in a large jar, and poured the starter over the top. Cover it with cheesecloth and a rubber band and let it sit for a few days on the counter-top. The only thing you really to do is stir it once in awhile and make sure all of the kale stays submerged. Bubbling is great, not so many bubbles means it’s pretty much done and it’s time to go in the fridge. It’ll keep in the fridge for a few weeks. The result is a slightly sour, pickle-y kale, that is not crunchy/ fresh and not soft/ wilted, either. It’s somewhere in between. I found it to be not as bitter as fresh kale can be (and I really like fresh kale). As for applications, we’ve only used it once (recipe coming soon) but I can see it being good in a stir fry, fried rice, or maybe even a topping for a brat or hot dog. Don’t look at me like that, it’s basically a sauerkraut. You guys. I really don’t have too much to say about this one. It’s like eating a big bowl of cheese-filled pasta and sauce, but there’s vegetables too. It’s awesome. This post is very late. A few years too late, really. Even now, I’ve spent the last two weeks writing it. Anyway, we started making tamales as a family in late 2015. The tamales turned out great, but we didn’t make very many. The year after, around Christmas, we decided to do it right: we made about 15 pounds of pork, flavored with a pepper sauce made from scratch, and my husband’s late step-grand-mother’s masa dough recipe. We enlisted help by launching our first ever tamale party, inviting our close family and friends. Unfortunately for us, the party got snowed out and only a few people were available to help us roll dozens of tamales. Even with the help, my husband and I were up late, watching every Workaholics episode known to man, dutifully rolling tamales. Needless to say, we had tamales for days. Well into June, in fact. Dear readers, my family and I are about to move for the second time this year. We are about to embark on an 8 hour car ride with all of our things and three kids in tow. We need snacks. Healthy ones. Enter: the miraculous date ball. I first started making these when my cravings for Lara bars got too extreme (they’re expensive, guys!). When my third baby came around and I was nursing every second of every night and day, these quick bites saved my life. They’re packed with nuts and fruit, sweet and a bit salty, good fiber and fast energy. I have to hide them from my kids so they don’t eat them all. I’m not sure if that’s a selling point or not. Let me tell you guys something about homemade pizza. Not only does pizza hold a special place in my heart, my husband and I have been perfecting ours for about 8 or 9 years now. We’ve tried a zillion different pizza crusts, sauces, and cheese combinations. I feel like pizza in general deserves a bigger, much more expansive post. A story. A tutorial for every pizza aspect and variation. I could write about pizza all day. But alas, I am but one blogger and you are but one reader. I guess we will do them as they come. Recently, we made our version of a spinach pizza. We basically made a Greek spinach pie filling and put it on a pizza. It was pretty rad. Make your pizza dough well ahead of time, even the day before will work, but the afternoon usually works okay too. When it’s ready preheat your oven to 350. If using a pizza stone (see what I’m talking about with homemade pizza variations?! You basically need a pizza stone though, thank me later), make sure it’s heating up with the oven. Heat about 3 tablespoons of the olive oil in a large skillet over medium high heat. Saute the onion, green onions, and garlic until soft. Stir in the spinach and parsley and cook until spinach starts to wilt. Remove from the heat. In a medium bowl, mix together the eggs, ricotta, artichokes, and feta. Fold in the cooled spinach mixture. Add a bit of salt and pepper. In a small bowl, mix all the shredded cheese together. Once the oven is ready, take out the hot pizza stone and, doing the best you can (it never turns out perfect), stretch the dough into the rough shape of a circle. Pop it in the oven for about 15-20 minutes or until the crust is puffy and lifting off the stone around the edges. The butter is for the crust -smear it liberally around the outside crust, following it up with the garlic salt. 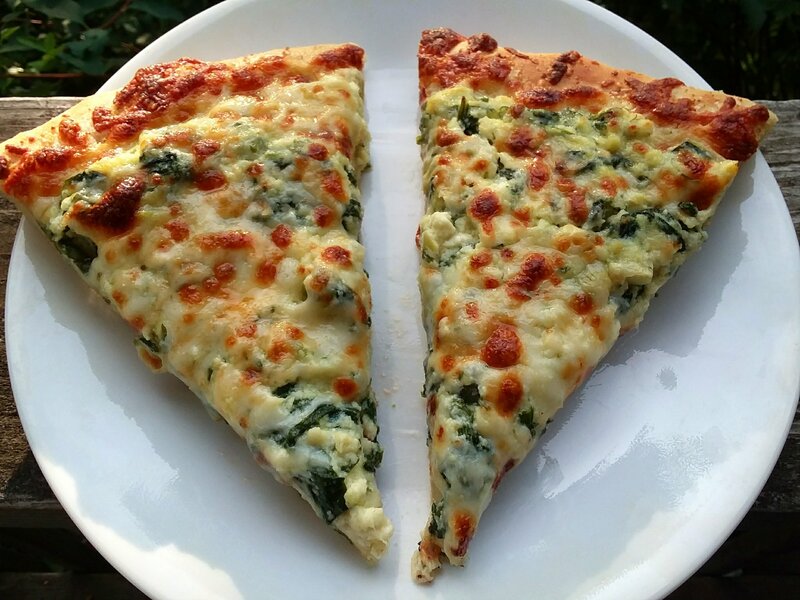 Spread the spinach mixture on the pizza, just like you would do with regular sauce. Don’t be afraid to put a bit extra on it. Top this with the cheese mixture. Back in the oven it goes. Bake the pie for about 10 more minutes, until the cheese is nice and melted. To get it golden brown on top, I turn on the broiler for a couple of minutes near the end. Allow to cool for a few minutes before cutting up and serving. I’m always looking for excuses to break out my slow cooker. Sure, you could always use a pressure cooker, but there’s a special joy in doing some prep work in the morning, forgetting about dinner all freaking day, and then remembering you have a delicious meal ready to go in your kitchen come dinner time. It’s pretty much magic. Magic that you work for, but still magic.